When should we contact you to book a newborn session? It is best to contact me during your second trimester if you are interested in having a newborn baby session booked. This allows for me to take note of your due date and to create availability around that time frame for your session. If you aren't able to schedule that far in advance or didn't think of getting a photographer until later, that is ok too! Give me a shout and we will figure out something that works for everyone. How will we know when to schedule our newborn session? Once your baby decides to make his or her arrival, you will contact me via email or text to let me know the happy news. I will be in touch with you so that we can decide and narrow down a date/time for your session. The session will ideally be booked when your baby is between 7-9 days of age. At what age is the best time to schedule a newborn session? The ideal age to schedule your newborn session is between 7-9 days. This is a very important time frame as your baby will still be sleepy, squishy, bendy, and cooperative in order to achieve the portraiture that you see in my portfolio. It is preferred to schedule the session no later than 2 weeks of age, however, there are always exceptions. The older your baby gets, the more awake and alert they will become. They will also enjoy stretching out as they realize they are not in your womb any longer and they have all the room they desire. What can we expect during our newborn session? It is best that we start the session with your baby well fed. Typically upon arrival, I will have you strip your baby down to a diaper and wrap them up in a blanket for warmth and have you feed them. Most babies at this age will fall asleep after feeding (the “milk-coma”). Most of the session, your baby will be bare with special consideration to pose them in ways that will cover them. Because your baby will be bare, it is important that we keep their environment warm, around 85 degrees. If we are slightly uncomfortable with the temperature having clothing on, then your baby will be comfortable with no clothing. I use a space heater for the immediate area as well as white noise to keep your baby sleepy and to keep them warm and cozy. Everything I use is washed and cleaned. It will be important to keep towels and wipes nearby and spare clothing for parents (just in case). Most of your baby’s session will be while they are sleeping. It is during this time that I am able to move them from pose to pose, prop to prop, and position them without them moving or being disturbed. We will get a few awake shots for you as well if you desire and if there is an opportunity. Can I get family shots or shots with my other children? Yes! We will also take any family pictures that you wish during your session. If there is a sibling we will do those photos in the beginning. If it is a young sibling (under 10), then I will ask you to only bring them in the room for only the first 30 minutes of the session, so that I can focus on your baby. Newborn sessions require a lot of patience and another small child might make it harder to capture all those precious, split second moments. 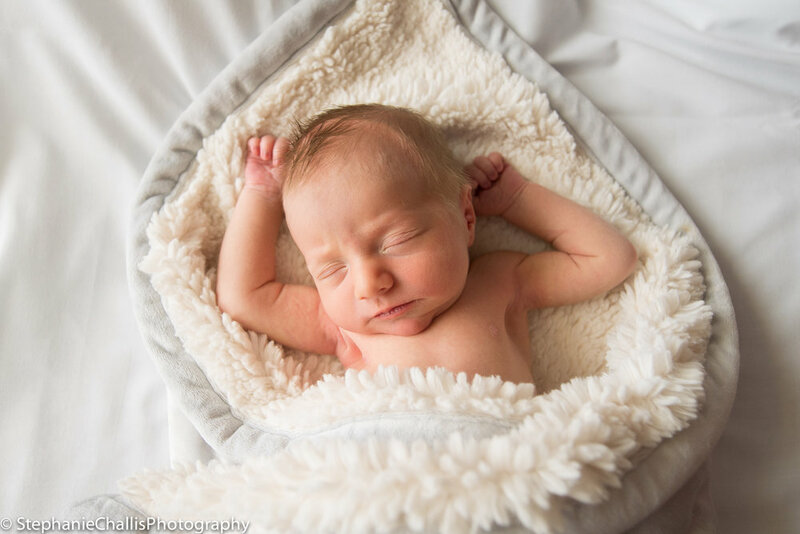 Newborn pictures are a delicate and intimate moment , so I ask that you please do not bring additional people or family members like grandparents unless there is room for them to hangout in another area when they are not in the images being taken. I shoot all sessions on location, this could mean either your personal home or at the hospital. I will bring with me all the needed equipment including a backdrop, props, heater, etc. If we are having the photoshoot in your home, I will need an open area near large windows if possible. Natural light provides the most flattering and whimsical images. This area will need to be a minimum of 7ft by 4ft (a lot of couples simply move the couch). Your baby will run the show and we will take several breaks for feeding and consoling. A newborn session will typically last two- three hours and your little one will usually do best during this amount of time. This amount of timing usually allows for a few various poses on a textured blanket background for the very classic and timeless portraits, 2-3 “prop” set-ups such as baskets, buckets, etc, and a few family and sibling shots. I usually take multiple shots and compositions of the different setups, which results in a gallery of about 30 images. Although sessions are never rushed, the most important images should be captured within the first three hours. How can I prepare on the day of our shoot? First thing is to think of any special items you would like to be included in the shoot. Perhaps it's a special blanket grandma made or dad's old baseball glove. It is not always possible to incorporate everything, but I will try my best to make your images personal and touching. It is best that we start the session just after your baby’s feeding. Please don’t eat anything spicy the day before as it can irritate the baby and that you keep the baby awake in the morning for a few hours before the session so that we have a better chance of a very sleepy baby. For your family images, I love when my families are willing to photograph with their bare shoulders. This entails dad removing his shirt, and mom will be wrapped in fabric. Your skin, next to your brand new baby’s skin photographs so beautifully. I also suggest solid black, white or neutral tops with sleeves paired with blue jeans for your family images. Whatever you decide to wear, stick to a color palette (everyone the same) and avoid any patterns or logos. Sleeveless, long, or 3/4 sleeves look best (I find short sleeves don't photograph as well). P.S. Don’t forget to have a spare outfit in case of accidents! When will our pictures be ready? You will receive a sneak peek teaser from your session on Facebook within the first few days of your session. The completed session will be uploaded to a private gallery within 2-3 weeks of your session and you will receive an email with instructions. This online gallery will remain available for download for 1 week and during this time, I will help you with your order and go over different products available to you. I provide all the props we will need. If you have any special items you would like to be included in the shoot please have them cleaned and available. Perhaps it's a special blanket grandma made or dad's old baseball glove. While It is not always possible to incorporate these special items due to the way they photograph, I will try my best to make your images personal and touching. I would love for you to tell me a few colors you might like me to use with the baby that you think would complement the other colors in your home.